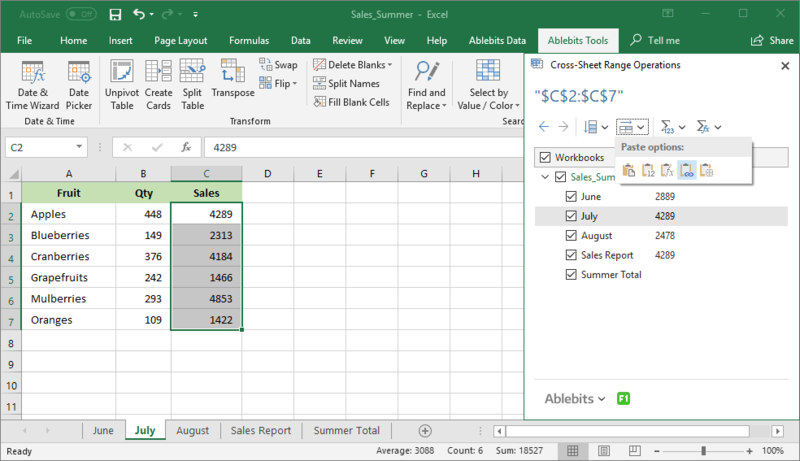 Cross-Sheet Operations is a set of two utilities for work with same cells and same ranges in multiple Excel sheets. 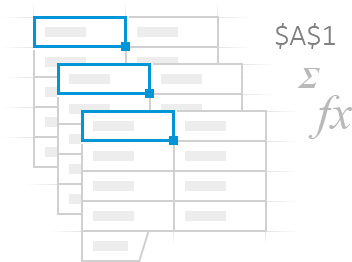 With Cross-Sheet Cell Operations, you will edit, create references, copy, or aggregate same cells. The Cross-Sheet Range Operations utility will help you copy same range and aggregate either all same ranges together, or each one separately. 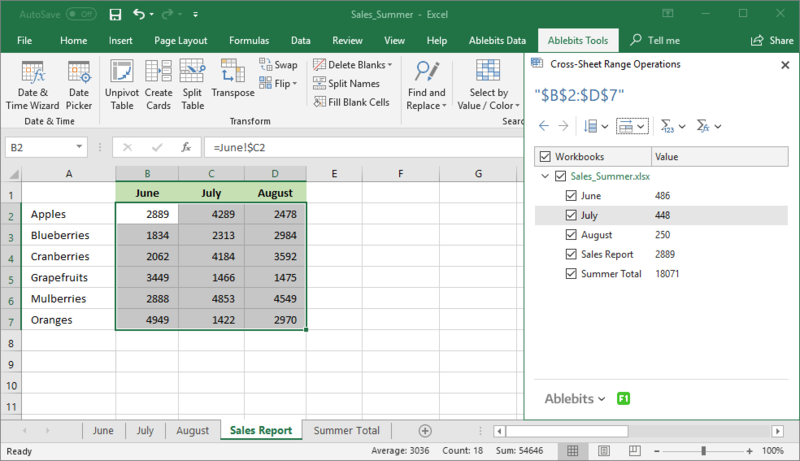 Edit the same cell You can edit the same cell across all open sheets or only the selected one. Copy the same cell or range Copy the same cell or range values and paste them vertically or horizontally. Aggregate same ranges together Perform operations with all same ranges and get the result pasted as a value or as a formula. Sum the same cell Select a function to apply and paste the result as a value or as a formula. 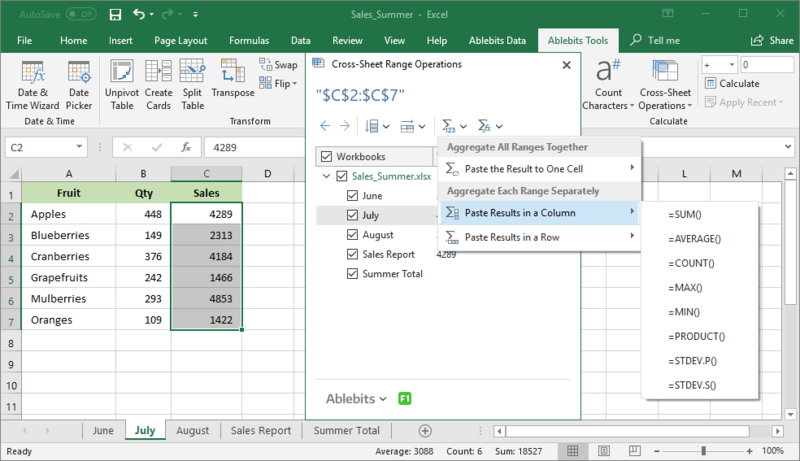 Reference same cells or same ranges Select the paste option: paste values, create references, pull links, or paste without borders. Sum each range separately Sum each same range across multiple sheets and paste the results in a column or in a row. What is Cross-Sheet Operations and what do I need it for? 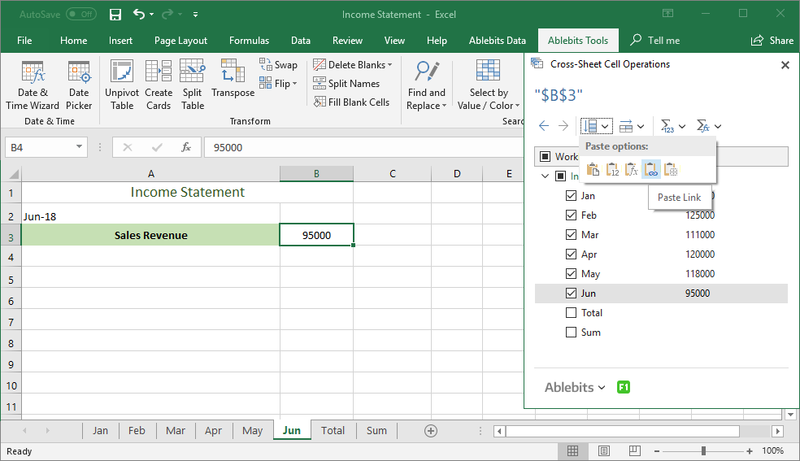 Cross-Sheet Operations is a tool for Excel, part of Ablebits Ultimate Suite for Excel. It will help you review, edit, reference, or aggregate same cell and same range across multiple Excel sheets. First of all, you open the Excel books that contain the sheets you are going to work with. Select the cell or the range of interest. Run the Cross-Sheet Operations tool by clicking its icon in the Calculate group on the Ablebits Tools tab and select the Cell Operations or the Range Operations utility. Make sure to check all boxes next to the sheets you need. In the tool’s window, select the action. Can I copy the same cells and paste them where I need? Yes and yes :) You will select the range where you want to get your values inserted and choose to paste them in a column or in a row. Besides, you can select the paste option: paste values, formulas, links, or paste without borders. How to reference same cell from multiple worksheets in Excel? Select the cell you want to reference, run the Cross-sheet Cell Operations tool, and check all the sheets of interest. Decide whether you want your references to be pasted vertically or horizontally, click the corresponding button and choose the Paste Link option. The tool will ask you to select the cell where you want to pull references. What operations can I perform with the values? You can choose one of the following Excel functions to apply to the same cell: AVERAGE, COUNT, MAX, MIN, PRODUCT, STDEV.P, STDEV.S, or SUM. When I sum same cells or ranges, can I paste the underlying formulas? Yes. It’s up to you what to paste: simply values or formulas. The tool lets you do both. Do I have to open all books that contain the sheets I want to review? Yes, all the workbooks should be open, so the add-in could include them in the review. Is it possible to change same cell in many sheets simultaneously? Sure! 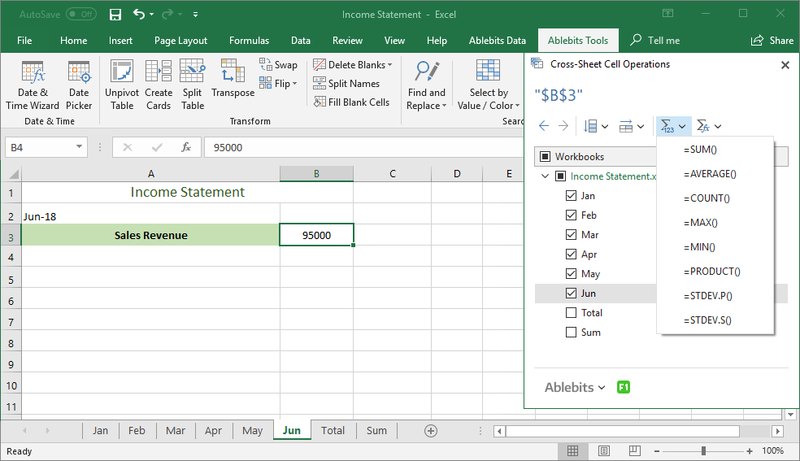 For this check the worksheets of interest, double-click a value in the add-in window and enter the one you need. Same cells in the selected sheets will be changed. Can I edit same cells of only particular sheets, not all the open ones? Yes, you can select the sheets where you want to change values, the other ones will remain intact. What if something goes wrong, is there a chance to undo a cell entry? Yes, you can undo a single cell entry or, if you edited several sheets simultaneously, you can undo all edits. Can I sum all same cell ranges and get the result as a formula? Sure, for this you should run Cross-Sheet Range Operations and click the corresponding button. Is it possible to sum each range separately? Yes! Start Cross-Sheet Range Operations and select the Aggregate Each Range Separately option. The result values or formulas can be pasted in a row or in a column.